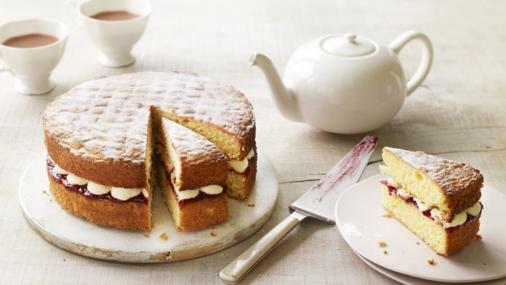 For the final technical challenge Mary Berry asked the bakers to make this simple sponge with homemade jam and buttercream – without a recipe. For this recipe you will need two 20cm/8in sandwich tins, an electric mixer and piping bag fitted with plain nozzle. Preheat the oven to 180C/160C Fan/Gas 4. Grease and line two 20cm/8in sandwich tins: use a piece of baking or silicone paper to rub a little baking spread or butter around the inside of the tins until the sides and base are lightly coated. Line the bottom of the tins with a circle of baking paper.